Today in my Interview workshop I went off on a rant about the importance of being a fit in the workplace. It’s not enough to have the job-related skills that allow you to hit the ground running, I told them. Most of my participants nodded with agreement, while others had to process this point–maybe it never occurred to them, or maybe they were convinced that being able to create code is all they need to do. Further I told them there’s been a lot of talk from recruiters and hiring managers who reinforce this point. “Really,” the naysayers eyes said. Really. In an article entitled BRAVE Cultural Framework by George Bradt, the author talks about how employers are looking for job candidates who understand and can demonstrate they’ll fit in with the company. Employers are looking at: the way people Behave, Relate to others, display their Attitude, express their Values, and the work Environment they create. As jobseekers, you should keep this framework in mind by remembering the five letters and what they stand for. This is imperative to successfully landing a job where employers are astute enough to realize that overall fit is essential to a productive workplace. Remember these five components when you prepare for interviews, as you’ll most likely have to field questions based on the B.R.A.V.E framework. Behave: This is how you make decisions and/or behave under leadership. Are your decisions the right ones that contribute to a better run business? As individual contributors, do you toe the line, contribute ideas that are implemented, deal well with autonomy or deal equally well with reward and discipline? These are all considerations, and more, that might arise at an interview. Relate: This is the way you interact with others and create a team environment. You relate to difficult support staff and take appropriate measures to keep everyone on the same page. You understand differences of opinions and methods and work toward a team environment, even with those with whom you disagree. Attitude: “A big part of this comes through in individual and organizations’ sense of commitment to what they are doing,” the article says. Does the manager promote the proper attitude, make her support staff see the mission of the company or organization? Do the support staff embrace the mission and goals of the organization? This is where someone might be said to have a “bad attitude,” and this could be the mark of death. 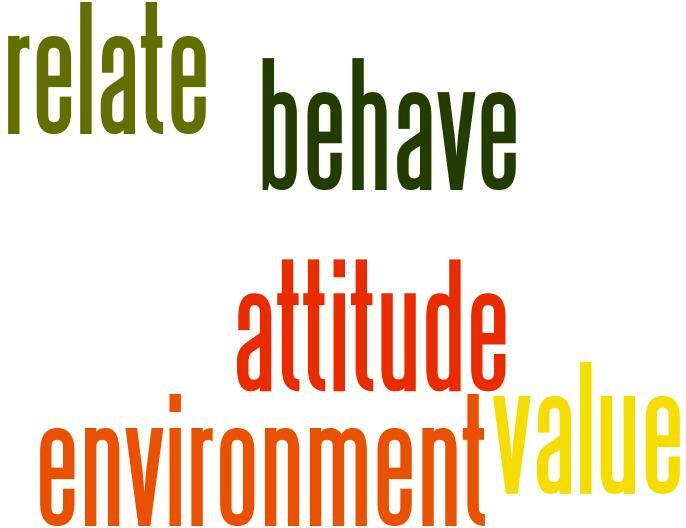 Values: As a manager, you must instill values that foster learning, advancement, creativity, autonomy, etc. Staff must hold the same values as the company, or there could be conflict. To understand the values of the company, you must ask the appropriate questions at the interview to uncover them. For example, “How important is creativity to ABC Company?” If you get a blank look, chances are you’re at the wrong interview. Environment: The article talks about the way people approach the workplace in terms of “formality/informality, preferred office layout, etc,” but it’s really an accumulation of all the aforementioned components, in my opinion. Environment is created by upper and mid management and sustained by the support staff. How one behaves, relates to others, her attitude, and values, are what creates a healthy and efficient work environment, not dress and working hours. It’s a well-known fact that employers look for three qualities in potential employees. Can they do the job? Will they do the job? And will they fit in? B.R.A.V.E answers the third component, the fit. You must prove that you can work with your support staff, inspire and motivate them to work toward the company’s goals. Likewise, you must show that you are adaptable and can work with any management style. Will you follow the B.R.A.V.E framework? Employers are banking on it. This entry was posted in Career Management, Career Search, Interviewing and tagged attitude, BRAVE, Career Management, fit, interview, values, work environment on September 5, 2014 by Things Career Related. Love the acronym! Thanks for reinforcing this critical component of interviewing. Thanks, Stephanie. A lot of emphasis is on the “soft skills” these days. As I prepare to go into a Complete Interview Process workshop, I’ll talk about traditional interview questions, which cover the technical skills, and the behavioral-based, which dig for the personality skills.